Le Berceau des Sens is the Ecole hôtelière de Lausanne's training restaurant open to public. 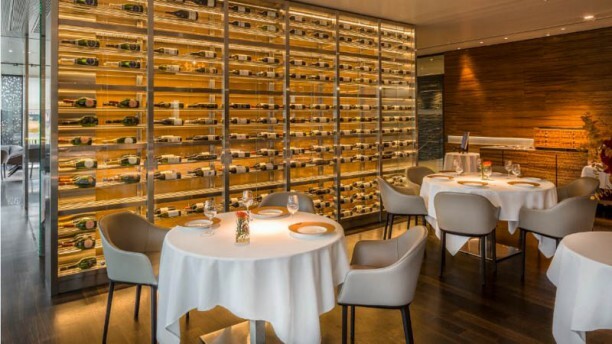 With a 16/20 point in the Gault & Millau Switzerland, our restaurant is a gastronomic attribution in the region, offering a truly contemporary culinary style, based on freshness and quality of our product. With its refined designer decor, matte colors and clean lines, Le Berceau des Sens is an experience itself. The prestige of the Ecole hôtelière de Lausanne is reflected in the restaurant as excellence meets the table - in both taste and service. Come enjoy several menus, including vegetarian dishes, in the main dining area or the private lounge. Our menus are updated regularly in accordance with the seasonality and availability of products, ensuring freshness and maximum quality. The kitchen lead by Chef Cédric Bourassin, together with his team of professionals, brings the magic of French cuisine to the table. The magic is also performed at the table, under the supervision and benevolent eyes of their teachers, our students are introduced to all the requirements of a gourmet restaurant. Without experience and sometimes with a touch of shyness, with elegance they succeed in enchanting our guests, bringing with them enthusiasm and especially motivation to make BDS a very popular place. If you're looking to wet your palette, head for the new bar and lounge for a delicious cocktail created by our students and our professional bar team, or choose from our extensive wine list from around the world, served by the glass. Davide Dargenio (Chef sommelier), Best Sommelier of Italy 2018, and Samuel Boissy (Chef sommelier) inspire our students to experiment with unusual, but sensible wine pairings, perfectly complementing every meal. You're invited for an unforgettable dining experience at Le Berceau des Sens. Come witness the harmonious efforts of all teams involved, including our preparatory year students - efforts which have earned Le Berceau des Sens its reward in the Gault & Millau Switzerland! PUBLIC TRANSPORT: The M2 subway will take you to the “Croisettes” station. From there, take the bus n°45 to the “Ecole Hotelière” stop. BY CAR: There is a visitors car park (Ecole Hôtelière Lausanne), which is free of charge for restaurant guests. The food is very nice, the space as well and the staff very kind and helpful! A pleasure to see young people developing their skills while serving you a Michelin Star Menu. The food was superb, The taste and the "look" deserves 5* for a normal restaurant. Taking into account that is a restaurant run bu students I would give it 6* if that would be possible. The service was good. The teachers were all over the students to make sure their students were looking after the diners well. It is a delightful culinary experience and the EHL students provide a first class service. This restaurant is quite unique. It is part of the Ecole Hotelliere, so the service is taken care by the students, which makes the athmosfere sweet and funny. And the food experience is unforgettable!